The story of Antara Telang, says Sanchari Bhattacharya, is a hopeful reminder that the incredible spirit of some of us is sometimes capable of hoodwinking even the greatest odds. What happened to Antara Telang is a grim reminder of how some of us often end up paying dearly for the indifference and incompetence of others. 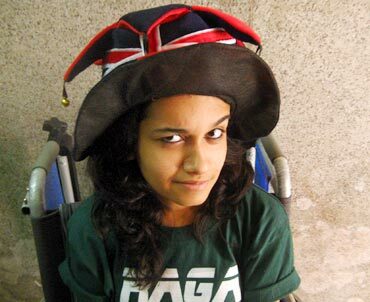 Antara is a 18-year-old student in the First Year BA course at Mumbai's prestigious St Xavier's College. On a rainy day this July, she lost her right leg while she was on her way back from college, when the heavy branch of a peepul tree fell on her. The branch crushed her right leg beyond repair and damaged her left leg seriously. The tree, located near Antara's home in suburban Sion, hadn't been pruned in ages by civic officials. The gardens department of the Brihanmumbai Municipal Corporation, the most affluent civic body in the country, is in charge of pruning trees across Mumbai. The department enjoys a whopping budget of Rs 100 crore (Rs 1 billion) to ensure that incidents like this do not happen. "There are hardly any trees in Mumbai. Why can't they take care of the few that there are," asks Antara. This is the reason the spunky teenager has decided to speak out about the incident, hoping that the media attention will force the authorities to ensure that a similar tragedy doesn't befall anyone else. "This kind of news is forgotten the very next day. But the victims have to live with it their entire lives," she says. Antara is quick to point out that at least her voice is being heard by the people; many people in similar situations don't even have that privilege. When the branch fell, says Antara, she was knocked unconscious. The local fruit vendor and chaiwallah had rushed her to a nearby hospital. Another vendor was hit by a branch of the same tree and he received a serious back injury. "No one is talking about him," she says. "He couldn't attend his shop for 2, 3 weeks. He also deserves compensation, but people like him don't receive any attention." Antara also talks about Tamanna Bhojani, whose spine was fractured by the branch of a jamun tree. "Instead of helping her," she adds in an exasperated tone, "her office fired her." "It is like there is just no value for human life nowadays," she says. " Reports about such serious injuries or deaths is only a small snippet in the newspapers." But the painful incident has not embittered Antara, who credits her friends and family for their rock-solid support during this tough phase of her life. "My family and friends treat me normally," she adds, "that makes a lot of difference. They don't make me feel as if something is wrong. My family is very supportive; my friends make me laugh. They don't make me feel disabled." With a smile in her voice, she adds how close friends visit her regularly and make her reality lighter by cracking inane jokes. They even make fun of her prosthetic leg -- an appendage she is still getting used to -- teasing her that she could easily kick someone with it. The people who do make her feel over-conscious are those who act "extra polite and extra careful" around her, she says in an amused tone. On a more serious note, she adds, "When I go out, people stare at me because I am in a wheelchair. That takes some getting used to." 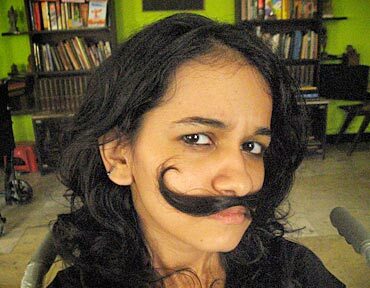 Shrugging off the onus of being 'different', Antara says, "I don't want any special treatment. I only want to be treated normally." For someone as full of life and outbound as her, sitting at home for almost two months, recuperating from her injuries, is frustrating. "I get really bored sometimes. But then I tell myself, it is just a phase. I will start using the prosthetic leg and be back in college soon," she says confidently. Though Antara missed her mid-semester exams due to the accident, St Xavier's college made special arrangements for her to take the exams again. 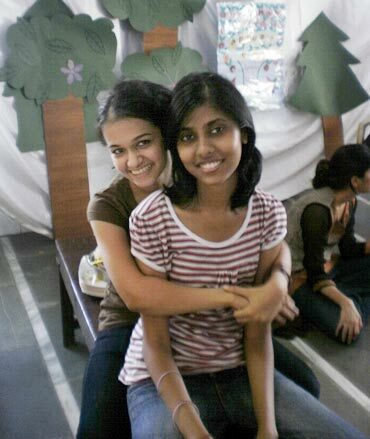 Students at her college went the extra mile to make sure she could attend Malhar -- St Xavier's high-profile annual fest. Members of the Malhar organising committee pulled out all stops to ensure that Antara, who was then bound to a wheelchair, enjoyed her time at the overcrowded event. "They were willing to make arrangements for me, but I realised I was too much of a logistical hassle. So I left early," says chirpy Antara. She is at a loss for words when well-wishers hail her courage and brevity; when she is asked how she faces the world with the same amount of enthusiasm even after the incident. "I really don't know what to say," she says. "This is how I have always been. I am a positive person." Then, she adds with gusto, "You can't cry all the time. I am not the kind of person who cries anyway." Antara Telang's story is a hopeful reminder that the incredible spirit of some of us is sometimes capable of hoodwinking even the greatest odds.